The Big Three. The Triple Threeat. An unfair NBA monopoly. 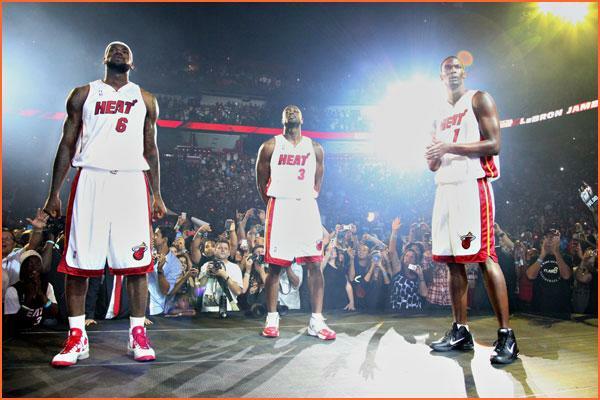 Whatever you call them, Lebron James, Chris Bosh, and Dwyane Wade made waves (okay, tsunamis) this past summer when they announced that they all would be signing with the Miami Heat. And the months following Bosh’s tweet and Lebron’s Decision (insert derisive snort here) were filled with speculation, predictions, and anticipation. Basketball fans, outside of Cleveland, were crowing about the new NBA dynasty. Hell, James, Bosh and Wade practically accepted the 2011 NBA championship trophy back in August. And then the season started. After a first game loss to the Boston Celtics, the Miami Heat have racked up an underwhelming and completely ordinary record of 16-8. Miami has left a lot of people wondering what’s going on and should count themselves lucky that they’re in the Eastern conference. Their .667 winning percentage would land them all the way in 6th place in the Western Conference. However, even more telling than the number of losses the Heat have racked up is the analysis of those games. Of their eight losses, seven of those have come at the hands of +.500 teams. Conversely, only three of their 16 wins have been over +.500 teams. Bottom line: Miami is struggling against the best teams in the league. You know, the teams they’re most likely to face in the post-season. A breakdown of the Big Three and their impact on the team’s losses is also interesting. When Lebron, Bosh, and Wade scored similar amounts of points, the team tended to lose by a bigger margin. For example, in their 104-95 loss to the Orlando Magic, James scored 25 points, Bosh nabbed 21, and Wade collected 18. However, in a game where one of the three scored a much higher number of points, Miami wasn’t blown out quite as badly, such as their 116-114 defeat against the Utah Jazz in which Wade, James and Bosh scored 39, 20, and 17 points respectively. In other words, the Heat are more competitive when one of their stars has a breakout night. And apparently that star shouldn’t be Lebron, seeing as how six of the team’s losses have come when he’s the leading scorer. Burn. In addition, only 5 of the teams victories have come when James is the leading scorer. This is a much different place for the King, as he was the leading scorer in nearly every game he played with the Cleveland Cavaliers. Based on the team’s success, or lack thereof, when James puts up big numbers, it’s becoming clear that on this Miami team, he may need to take more of backseat to Wade for long term success. Miami has also shown that they struggle to close out close games. Four of their losses have been by less than five points, and two of their losses were by a margin of two points. This is one of the most surprising thing, as Wade has proven himself to be one of the most capable final shot performers in the league, right up there with the likes of Kobe Bryant and Paul Pierce. 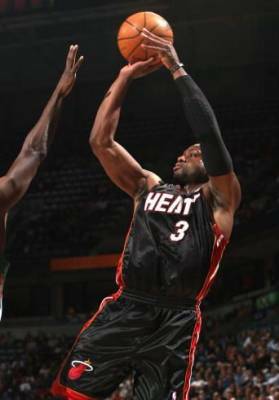 The Heat need to get the ball to Wade in the waning seconds of close games to get off that final shot. On the flip side, all of the Heat’s victories have come by a margin of eight or more. Their largest victory to date has been a 32-point massacre of the Minnesota Timberwolves. Super impressive, considering the T-Wolves have a 6-17 record so far, and have pretty much already been eliminated from the playoffs. The two things Miami must do better to win consistently are slow down the pace of the game and protect the ball better. First, let’s look at the game pace. In nearly all of their losses, the Heat took fewer shots than their opponent. These guys need to slow down, set the pace, and not give up so many shot opportunities. 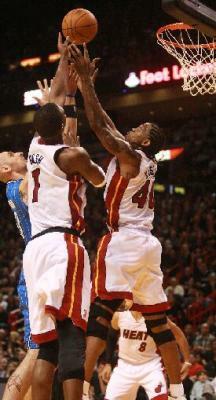 In their 106-95 loss to the Dallas Mavericks, Miami took only 75, while allowing Dallas to take 87. The Heat also need to take care of the ball. In their first two losses alone, they turned the ball over THIRTY times. James and Wade are responsible for most of these turnovers, which makes sense as they are the team’s primary ball handlers. However, eight turnovers by James in their loss to Boston, and six by Wade in their defeat at the hands of New Orleans is never really acceptable. It’s not just their losses that bring Miami’s weakness to light. Even when they’re winning, the team has room for improvement. First of all, these guys need to grab a freaking offensive rebound, for crying out loud (Bosh, I’m looking at you). Time to live up to the hype that (erroneously) placed you in the same talent bracket as Lebron and Wade. The Heat have been out-rebounded in 11 of their 13 victories. Even in their 101-78 killing of the New Jersey Nets, they only grabbed FIVE offensive rebounds, 13 less than the Nets. No wonder Miami is 4th in the league in points allowed in the paint. Now, in not-so-close games, like the ones Miami has been able to win, this may not matter. But take, for example, their 97-95 near miss against the Memphis Grizzlies. Memphis corralled 14 offensive boards, while Miami only collected 6. Perhaps a few more second shot attempts could have come in handy there, huh guys? Miami also needs to get their bench involved. I know, I know, what bench? 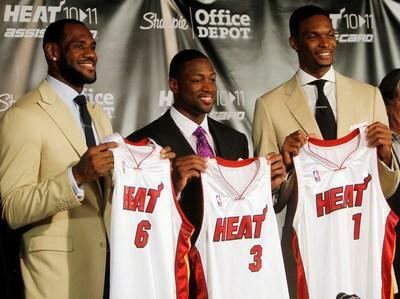 After signing James, Bosh, and Wade, Miami had about $37 to put towards the rest of the team. But in the event of an injury to one of the Big Three, Miami is going to need another option. So far, with the exception of an occasional strong performance from James Jones, the Miami Heat bench is basically nonexistent. In their recent dismantling of the Cavaliers, the Miami bench put up 37 points, compared to the Cavs’ 62 bench points. (And they only got to 37 points because none of the starters played in the 4th quarter.) And of the 89 points they put up in their most recent win over Atlanta, the bench was only responsible for FOURTEEN. Again, maybe in a easy victory this isn’t a problem. But in their two closest losses (116-114 against Utah and 97-95 against Memphis), the Heat bench was outscored both times. And, as mentioned before, if the collective psyche of Cleveland Cavaliers fans prevails and a high ankle sprain befalls James or Wade sometime in mid-April, Miami needs to have another source of offense. 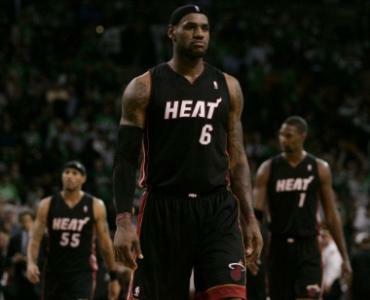 So, maybe it was a TAD too early for James, Bosh, and Wade to assume ultimate victory. Maybe the Medium Three is a better nickname for them. No, they aren’t completely sucking. In fact, they’re doing a lot right. But things certainly aren’t going as smoothly as the three of them expected. James needs to step back and let Wade shine more, particularly at the end of close games. The team in general needs to slow down and take care of the ball. And all three of them need to realize that all of the TV specials, laser shows and mock-humility when trashing the hearts of everyone in Cleveland mean nothing if you can’t back it up with consistently strong play against ALL teams in the NBA. See Also: Dwyane Wade stars as Miami rout the Golden State Warriors, Sorry Guys, But The Miami Heat Are Playing Really Good Right Now, Great expectations are the Heat’s burden, LeBron James Miami Heat: Maybe the Most Overrated Athlete of All Time, Most People Don’t Care About LeBron’s Betrayal, The Miami Heat Have The Most Melodramatic Intro Video Ever, and The Miami Heat: If Ya Aint Runnin’ With It, Run From It. Ashley Walker is a writer and editor living in Las Vegas. An avid sports fan, Ashley expresses her interest through her contributions to Prose Before Hos and on her personal sports blog, Skirt on the Sideline. Ashley is also a natural beauty writer for the Las Vegas Examiner. Links to Ashley’s work can be found on her website ashleywrites.com. Fantastic Morning, I just stopped in to go to your internet site and believed I would say I appreciated myself…. Excellent info is usually located on this world wide web blog site…. you can master multiple formats of writing…. Superior Morning, I just stopped in to go to your website and considered I would say I experienced myself…. Superior Morning, I just stopped in to go to your site and imagined I would say I enjoyed myself….